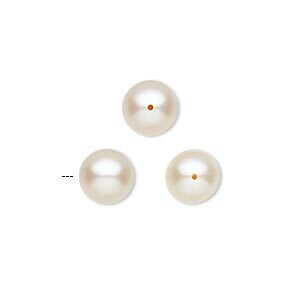 Pearl, cultured freshwater (bleached), white, 5-8mm flat sided potato with 0.2-0.7mm hole, D grade, Mohs hardness 2-1/2 to 4. Sold per 16-inch strand. 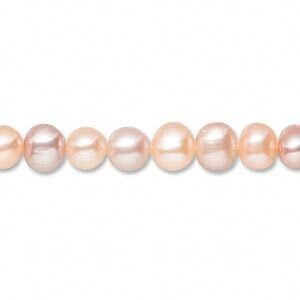 Pearl, White Lotus, cultured freshwater, peach, 5-7mm rice, C grade, Mohs hardness 2-1/2 to 4. Sold per 16-inch strand. Pearl, White Lotus, cultured freshwater, mauve and peach, 5.5-6mm semi-round with 0.5mm hole, B grade, Mohs hardness 2-1/2 to 4. Sold per 16-inch strand. 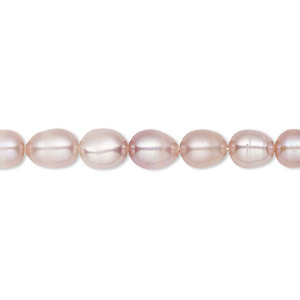 Pearl, White Lotus, cultured freshwater, mauve, 7.5-8mm button, B grade, Mohs hardness 2-1/2 to 4. Sold per 16-inch strand. 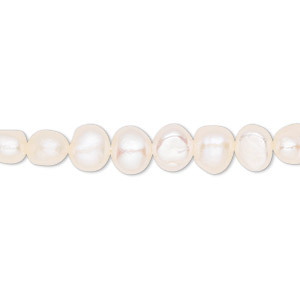 Pearl, White Lotus, cultured freshwater (bleached), white, (2) 8-8.5mm half-drilled round and (1) 9.5-10mm half-drilled round, B grade, Mohs hardness 2-1/2 to 5. Sold per 3-piece set. 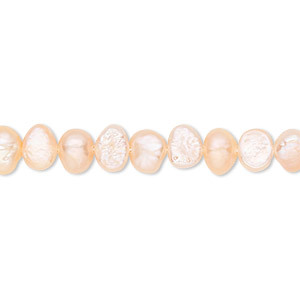 Pearl, White Lotus, cultured freshwater, mauve and peach, 8-8.5mm rice with 0.5mm hole, B grade, Mohs hardness 2-1/2 to 4. Sold per 16-inch strand. 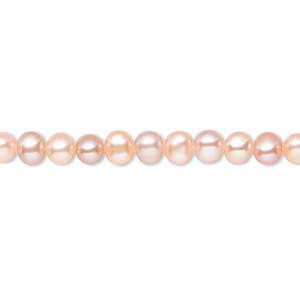 Pearl, cultured freshwater, peach, 5-8mm flat-sided potato, D grade, Mohs hardness 2-1/2 to 4. Sold per 16-inch strand. 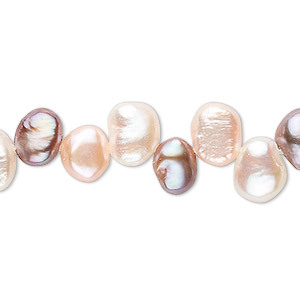 Pearl, cultured freshwater, mauve, 5-7mm rice, D grade, Mohs hardness 2-1/2 to 4. Sold per 16-inch strand. 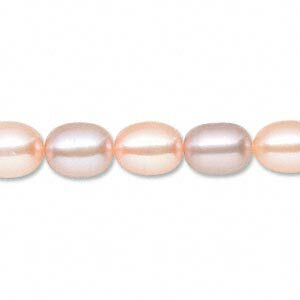 Pearl, White Lotus, cultured freshwater, peach, 6-6.5mm rice, B grade, Mohs hardness 2-1/2 to 4. Sold per 16-inch strand. 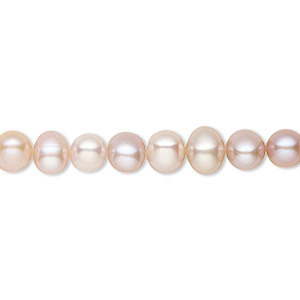 Pearl, cultured freshwater, mauve, 5-9mm flat-sided potato, D grade, Mohs hardness 2-1/2 to 4. Sold per 16-inch strand. 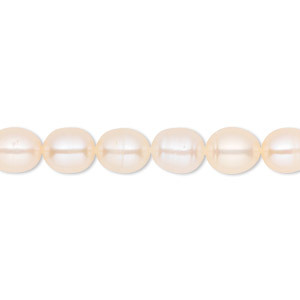 Pearl, White Lotus, cultured freshwater, peach, 5.5-6mm button, B grade, Mohs hardness 2-1/2 to 4. Sold per 15-1/2" to 16" strand. 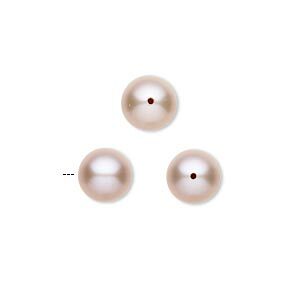 Pearl, White Lotus, cultured freshwater, dark mauve, (2) 8-8.5mm half-drilled round and (1) 9.5-10mm half-drilled round, B grade, Mohs hardness 2-1/2 to 5. Sold per 3-piece set. Pearl, White Lotus, cultured freshwater, peach, (2) 8-8.5mm half-drilled round and (1) 9.5-10mm half-drilled round, B grade, Mohs hardness 2-1/2 to 5. Sold per 3-piece set. 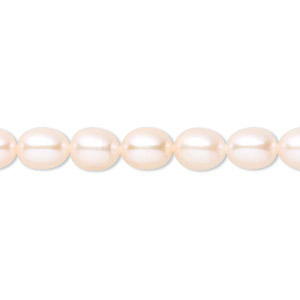 Pearl, White Lotus, cultured freshwater, mauve, 5.5-6mm button, B- grade, Mohs hardness 2-1/2 to 4. Sold per 16-inch strand. 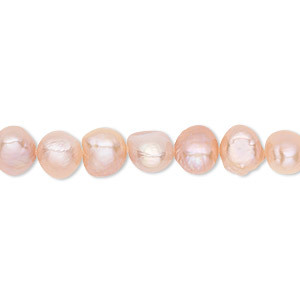 Pearl, White Lotus, cultured freshwater, peach, 7.5-8mm button, B grade, Mohs hardness 2-1/2 to 4. Sold per 16-inch strand.